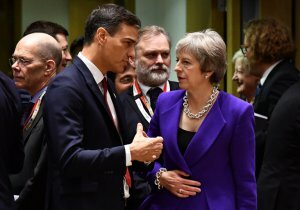 Spain’s Prime Minister Pedro Sánchez on Wednesday accused Catalan pro-independence parties of basing their cause on ‘lies’ and ‘manipulation’, comparing them to Brexit supporters in Britain. Using an unusually tough tone in parliament, he said both movements were built on ‘a tale of invented grievances, magnified by manipulation’. ‘It is necessary to remember that Brexit was based on a grotesque campaign of lies and unprecedented misinformation,’ he told lawmakers. Sánchez said Catalan pro-independence parties ‘only have lies to back their political positions’. ‘With Brexit we face a movement which goes against history and also against reason … Brexit and the Catalan separatist movement advance on parallel paths and with similar rhetoric,’ he said. ‘You are forced to choose between being European or British, or between being Spanish or Catalan, when we have lived with these identities and many others for decades,’ added Sánchez. His comments come as British MPs launched a no-confidence motion against Prime Minister Theresa May over her Brexit plan, sparking her biggest political crisis since assuming office a month after Britons voted in June 2016 to leave the European Union. Sánchez came to power in June this year after winning a surprise vote of no-confidence in parliament against the previous conservative government of Mariano Rajoy with the support of Catalan pro-independence parties. He initially tried to ease tensions with the Catalan government, but in recent days has hardened his tone against them. Sánchez’s government on Monday threatened to take control of security in Catalonia after radical activists blocked a highway over the weekend for 15 hours without any intervention on the part of Catalonia’s regional police force, the Mossos d’Esquadra. His cabinet is scheduled to meet in the Catalan capital Barcelona on 21 December. Pro-independence groups are planning street protests to try to stop the meeting from going ahead. Analysts say Sánchez has dropped his conciliatory tone in response to the strong losses his Socialist (PSOE) party suffered earlier this month in regional elections in Andalusia, a southern Socialist stronghold, and the gains made there by conservative parties. The conservative parties adopted a hardline against Catalan pro-independence parties. Sánchez is widely expected to call an early general election next year.